Most of President Trump's first days in office have been a dazzling (if contentious) string of fulfilled campaign promises including the cutting of regulations, efforts toward limiting immigration, and the successful appointment of a new Supreme Court justice who is considered to be a "strict constructionist". Recent days have given us cause to wonder if the honeymoon is over. Last week's missile strike on Syria angered and saddened those of us who supported Trump for his non-interventionist talk. Now in the past day, he has reversed on a number of economic as well as foreign policy issues. Economic and foreign policy issues? Sudden reversals? 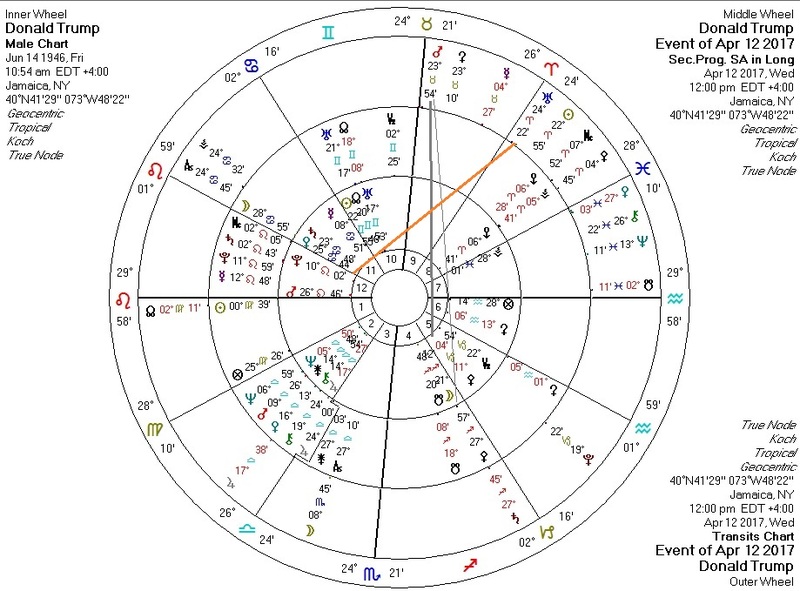 If you immediately thought of Venus and Uranus, then you'd have been right: transiting Uranus is square Trump's Venus. Of course, we might also expect some transit against his Pallas (representing intelligence and decision-making capacity). Transiting Mars is sesquiquadrate his Pallas and quincunx his progressed Pallas. Transiting Mars is also conjoining his MC, suggesting public action. Trump has Mercury square Neptune, and I have to say that as much as I like some of the things he's done, his (deliberately?) confusing messaging is getting annoying. Freddy McGruberApril 13, 2017 at 3:54 PM I voted for Trump, more than any other reasons, because I truly believed he wouldn't get us involved in any wars. I agree his confusing messages are getting very annoying. Even if he is manipulating people in such a way to get a good result in the end it is so hard to determine whether he really has a core set of beliefs at all or it's all just a game for him to flex his ego (there's all that Gemini sun Leo ascendent stuff in play)?! Thanks for your awesome blog. I have lurked here for a long time without commenting and think your take on astrology and libertarianism is so right on and unique. In a world of left leaning New-Agers, we are are in desperate need of more diverse opinions in the metaphysical/spiritual realms! I wouldn't mind getting a personal astrology chart from you sometime soon. ReplyDelete Replies astrolibertarianApril 13, 2017 at 4:06 PM Nice to meet you, Freddy. :) Delete Reply Spacer79April 14, 2017 at 12:02 AM I would have though Pluto. If there is no Pluto involved then perhaps the sudden change is superficial or maybe even part of some elaborate plot to confuse his enemies. We can only hope that he will not turn out to be a trickster. ReplyDelete Replies astrolibertarianApril 14, 2017 at 8:25 AM The effects of Uranus are sometimes reversible. Pluto, not so much. Trump has Sun conjunct Uranus, which very much denotes a "trickster". The question is: who is being tricked?